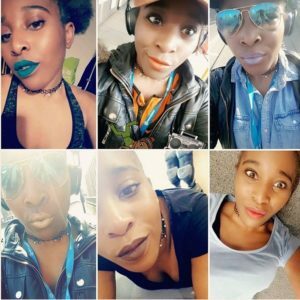 Week 4 Mes Amours…Week 4! So, before I report on all of the fun and frolics that may or may not have commenced, I must make a huge public apology to the wonderful Jeni Draper (BSL translation goddess) who was, in actual fact, last week’s ‘Chilli Chocolate Cookie Fairy’ which featured in Blog No 3. FYI Jeni, you can keep those coming! Monday morning began with Alim (The Lover/Dance Captain) entering into a fully blown identity crisis as Kerry referred to him as Emile (which he proceeded to do for the remainder of the week intermittently) while Bret (Fight Director) opted for a slightly less continental Adam! We were also rejoined by Saucy Steve (BSL Interpreter) freshly back from holidaying in the Canary Islands even though he had all of our songs running round his head as he sunned himself in the 20 degree heat – glad to know you were with us in spirit! He did however bring new joy in the knowledge that the BSL sign for ‘Razzmatazz’ is…JAZZ HANDS! 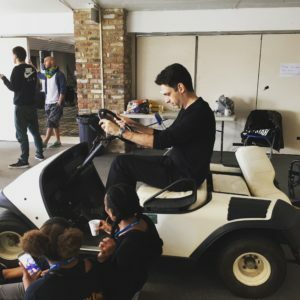 Post lunch , we were greeted with a golf buggy (NO SPOILERS) which saw Kerry leaping at the chance to give it a cheeky test drive…. methinks next time crash helmets should be provided! This led us into an afternoon of improvisation around the Sally Simpson section of the show which inspired Stacey (Mrs Simpson) to heartfully announce “Somebody call an ambulance… errr… don’t die” to her injured stage daughter. The result – Amy (Sally Simpson) howling with laughter. Kerry then tried to appease the situation by saying “You’re going to be great!” With Amy replying “I’m going to be stunning!” You’re not wrong there, love! In other news, Shekinah (Vivacious Vocalist) was set a challenge by the band boys to wear an outrageous shade of lipstick every day of this week. Monday’s shade – Teal (my personal favourite)! During Tuesday morning’s routine Company Pow Wow there was plenty of activity to report stating with Steve (Bass Guitar) announcing that he took his girlfriend for a romantic meal the previous evening. Adam (Drums) helpfully pointed out that 3 bottles of wine is not a romantic meal…where did you go?” Steve candidly replied “KFC!” #SheIsOneLuckyLady! Meanwhile, Alim, Julian (Officer 1) and myself (The Hawker) then admitted to having an impromptu sleepover where we gorged ourselves on Neal’s Yard Dairy cheese and watched The Who’s 1989 US Tour ‘Tommy’ concert on YouTube – we’re always working! It all turned sour for that same trio on Tuesday lunchtime when Patricia (Company Manager) caught us red handed stealing her precious Encona Hot Pepper Sauce from the Company Office to spice up our yummy Tandoori chicken! Following an intense morning of choreography, Amelia (Specialist’s Assistant) apologised to Kerry for step ball changing on her left foot as opposed to her right. Kerry responded with a playful “Its fine, don’t do it again or I’ll fire you!” Cue Pokemon Style Duel – just kidding, we were all giggling like buffoons. Oh, and Shekinah’s shade of choice for Tuesday was….Peach! Lovely! 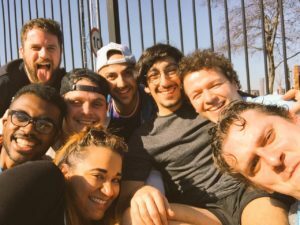 Some of the Tommy cast enjoying the Spring sunshine. Thursday morning found Lukus (Cousin Kevin) explaining that he had been a good boy the previous evening by going straight to bed (his own bed he hastened to clarify) and then justified this further by stating “I’ve been really good this week… rest wise I mean… not sleeping in other people’s beds!” After all this sleepy talk it was time to attempt a run of Act 1 in the morning and considering it felt like we hadn’t done it since 2001 it was a pretty valiant first go from all involved which set us up nicely for a fabulous run of the entire show later that afternoon! For said run we were joined by plenty of familiar faces for a tender bit of love and support including gorgeous Jenny Sealey and Helen from Graeae and the glorious ‘Team Ipswich’, Sarah, Jeni, Pete, Lorna, Tracey & Giles, who came brandishing tonnes of M&S sweet snacks…we thank you…come again please…every day in fact! (That’s not the only reason we love you, but it helps!!) Maybe this welcome sugar-high is what prompted me to spy Mark (Choreographer), Rob (MD) and Peter falling out of the gentlemen’s facilities giggling hysterically like naughty school boys! After such a fun packed but exhausting day, a good proportion of the company found themselves taking a sneaky trip to the public house to unwind with an half a shandy! Due to the momumental round that Rose (BSL Interpreter) bought I would say that everybody owes Rose a drink now… stagger it maybe though guys! Following the evening’s festivities, a very weary Patricia managed to fall asleep on the tube. Luckily for her Walthamstow, her final destination, was also the final stop (thank goodness it wasn’t the Metropolitan line)! Oh, and just in case you were wondering, Shekinah’s shades for Wednesday and Thursday were Lavender and Gold respectively! 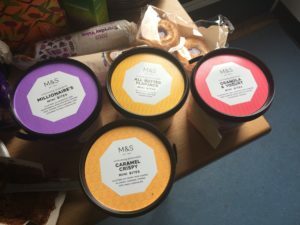 Plenty of treats for the cast from Marks & Spencers. 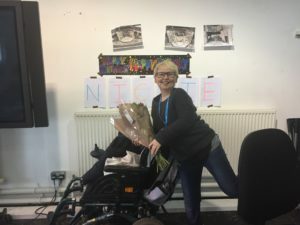 That takes us to our Frivolous Friday shenanigans and not only was it St Patrick’s Day but it was also the ’21st’ Birthday of Nickie (our awesome Associate Director). Nickie was spoilt with plenty of gifts, bubbles and treats while our handsome resident lad of the Green Isle, Julian, painted the Irish flag stripes on everybody’s face while William (Tommy) took the prize for ‘Best Outfit’ dressed head to toe in green and looking like a big, beautiful bogey! Sadly Alim, who was sporting a particularly stylish green pashmina, was told by Kerry that he looked like Barbara Streisand! The festivities continued throughout the day where the canteen were handing out cans of Guinness for 50p (I did not partake, I promise!) which Adam decided to gently nurse during the Sitzprobe of Act 1 (so rock and roll) while Garry (Uncle Ernie) gently slept his off in the corner! Oh, and Shekinah’s shade for Friday was… deep aubergine! Associate Director Nickie Miles-Wildin posing for her birthday! Well that takes us to Saturday which was a bumper day of dancing with everybody looking absolutely fabulous, if not slightly drenched by the end! Great day and thank you Team Dance (Mark, Kevin & Alim)! Shekinah found herself eating 4 pieces of chicken and an entire cucumber to energise her the day but she still managed to sport a sensuous Coral for her final shade of the week. Challenge accepted and COMPLETED! Must try harder band boys! Shekinah McFarlane’s week of lipsticks!